No, I was not at a waterpark when I took the above photo. Well maybe it is a water park, but it’s a water park that moves! This was aboard the newly remodeled Carnival Sunshine. Back in April, I had the chance to attend a 3 day/2night cruise, as part of a media event. It was my first time ever on a cruise ship and it wasn’t near long enough. Well, it was long enough to have me wanting to go back…like today, with my family! 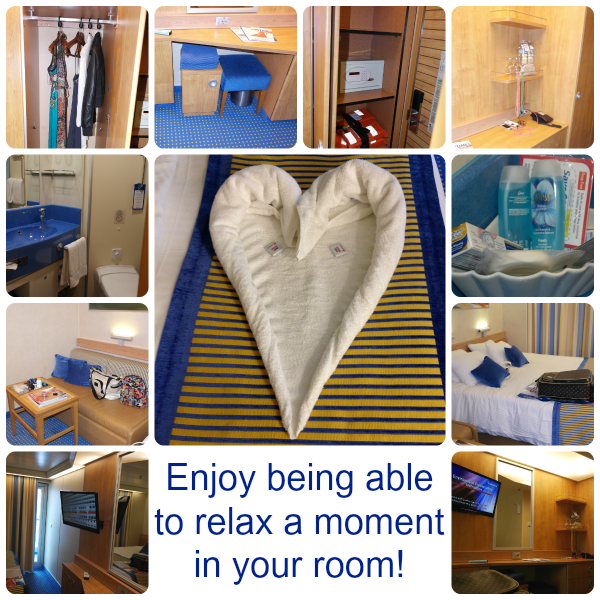 While I can’t do that just yet, I can share the awesome 2 night adventure I had aboard the Carnival Sunshine! I’ll admit, the first night was a little rough, as this was my first time really being out to sea and it was very rough, my sea legs were whipped out from under me pretty quickly. Even seasoned cruisers, said it was really bad (the moving and tilting). Thankfully I was able to pick up some bonine and the next two days were “smooth sailing”. The Carnival Sunshine has a new home, for the time being, and is docked in Port Canaveral. Once I boarded the Sunshine I headed right to my state room and was very impressed with the size of the particular balcony room I had! It would have been a little snug for my family of five, but a couples only trip for my husband and I , we would have fit perfect. The rooms are smaller than your average hotel room, but with so much to do on board, you won’t be spending much time in your room. Well, unless you are like me the first night. Before the boat took off, I was able to explore a little, and was so impressed with everything they had to offer. Whether you want to relax or workout, there is something for everyone. The best part is, most of the activities and eating areas (though not all) can be done with a view! I loved that I could walk on the treadmill or do my workouts all while looking out over the ocean! If you are there with a family, or as part of an adults only trip there is something for everyone. The Ocean Camp and teen club ensure the “Mom, I’m bored” don’t creep into this adventure. I noticed, that while there is so much to be done, the whole atmosphere just seems to put you in vacation AKA relax mode. With areas that are open to all ages and areas that are open to only 21 and older, you can ensure your vacation is going just the way you want it too. Parents, need a break from the kids, let them enjoy Ocean Camp while you escape to the 21 and over deck, then the next day spend time at the main deck or water works area and have fun with your family! One of the fun things about a cruise, is being able to get off the ship at the stops to see the local area or take it a step further with an excursion. Each cruise will have different excursions available depending on where you are cruising to! For this trip, we headed to a private beach for a day of fun in the fun and good food, of course! 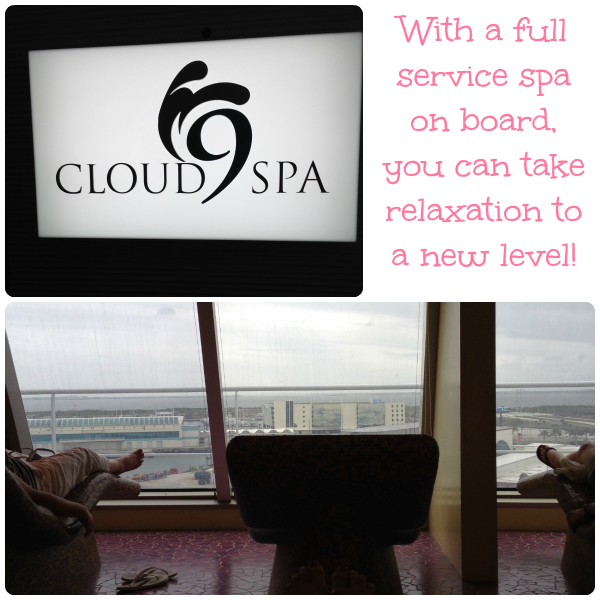 I really loved that they had a full service spa on board. After my excursion into Freeport, Bahamas, I went and had myself some pampering in the spa. With services like massages, facials, nail care, and even hair care the spa is sure to have something you will enjoy. They also have the heated stone beds, saunas, steam rooms, and more. This is perfect for a couples or girls trip! As part of a cruise, you get unlimited eats. Please note, that some eats don’t include sodas or alcohol, so be sure to upgrade to a drink card that will fit your needs. Cruise food is AMAZING. 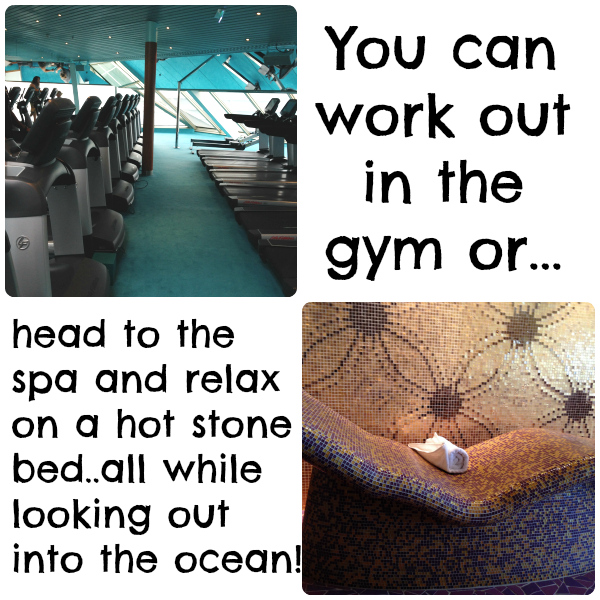 I was so impressed and the fact that it was all included in the cruise, was a bonus. I think my favorite was Blue Iguana, the breakfast burritos! 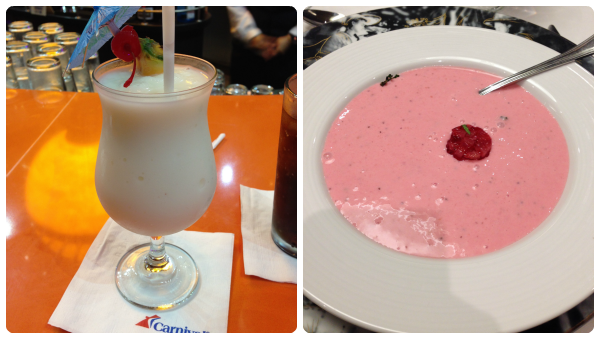 Regardless, there wasn’t a bad food experience on the ship! While aboard, I also went to check out the show EPIC, which is a group performing 70s and 80s rock songs and the show was, well…EPIC! I also checked out the adults only comedy show. They do have kid friendly comedy shows earlier, but the adult only is just that. You will not want kids in there for that show or if you are easily offended, you may want to go to the clean show. The comedian was hilarious and had my laughing from the time he came on stage to the time he left. If you like to dance, no worries, they also have a “club” for those who want to put their dancing shoes on. 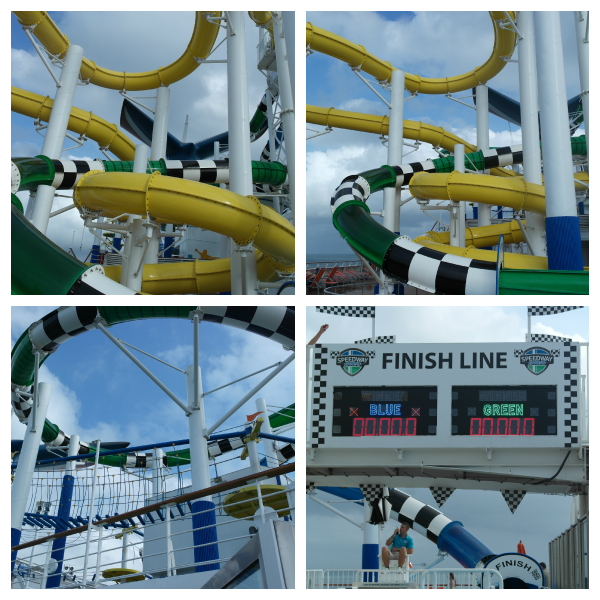 There was so much happening on the Carnival Sunshine, two days wasn’t near enough for me to really experience it. It gave me a taste of the cruise life, and it’s a life I want to make a part of our family…that’s for sure, preferably to Europe, though anywhere will do! 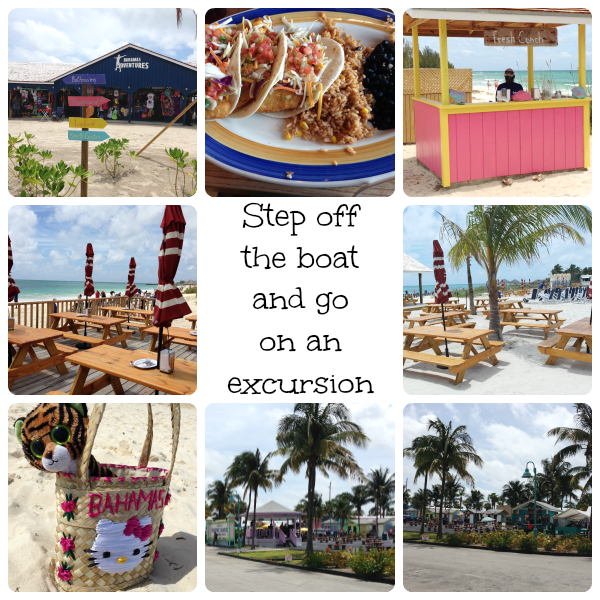 Whether you want to relax, have fun, laugh, enjoy good food, or go on an adventure that will leave you with lasting memories, you need to check out the Carnival Sunshine (or any of their other boats). It was truly an experience I will not forget, and will be experience again..but for much longer! Next time, I’ll be sure to remember my sunscreen! Have you ever been on a Carnival Cruise? Unfortunately never been on a cruise. Can you take me next time? Carnival looks like they have some pretty amazing ships. That looks amazing.I would love to go on a cruise the kids want to go on Disney one. I’ve been on a few Carnival cruises and have enjoyed them all. I will have to book another trip soon. I love cruises. They are their own little cities. Looks like you had fun. I’ve never been on any cruise. My husband wants to go on a cruise for our 10th anniversary. This sounds like the perfect getaway for families! And um, can I have hot stone lounge chair for my living room?! 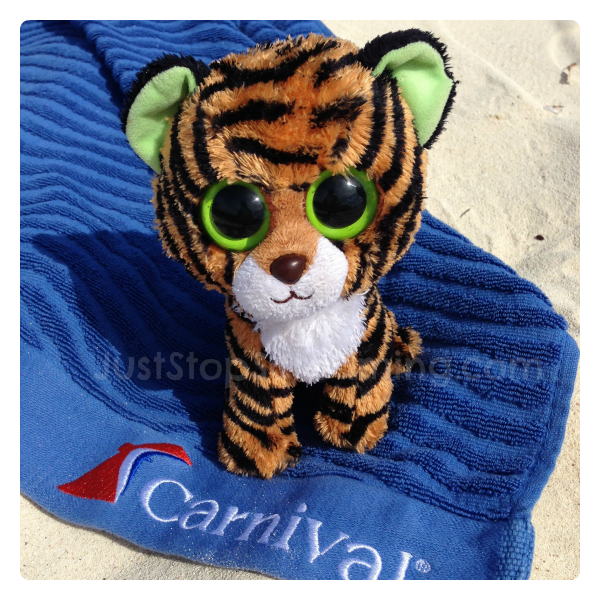 I haven’t been on a Carnival Cruise – but it’s on my bucket list!!! The ship looks AMAZING! So much fun to be had! You didn’t mention what that pink soup was… Strawberry mix/? Thanks for also giving us a inside look at the rooms. I always wonder what they would look like. Yes , once to the Mediterranean. It was quite an adventure. It looks like you guys had a wonderful cruise. I would LOVE to go on a cruise again. It’s been years since I;ve been on one. This looks like a great vacation. I want to go on a cruise so bad. I would prefer to go without the kids, but I like the fact that they are set up to handle the kids too. I’ve not been on a carnival cruise. But I’d love to go one day. We did cruise for our honeymoon. I’ve never been on ANY cruise, but maybe one day. It’s good to know that soda might not be part of the plan. I’d upgrade for that! You had me at spa … or those shaded seats! I have never been on a cruise and admit it looks amazing! I want to go on a cruise so bad! My hubby is worried about being seasick and ruining the trip, but I’m just going to do it at least once! I would love to take a cruise. Would be so much fun with the family. My husband has been asking for years to go on a cruise. This looks sooo relaxing, I might have to surprise him maybe next year. I can;t wait to go on a Carnival Cruise! I just have to find the time, they have said they would work with me. They have had a few great events in NYC, I have met many Dr. Suess characters! What a great experience. 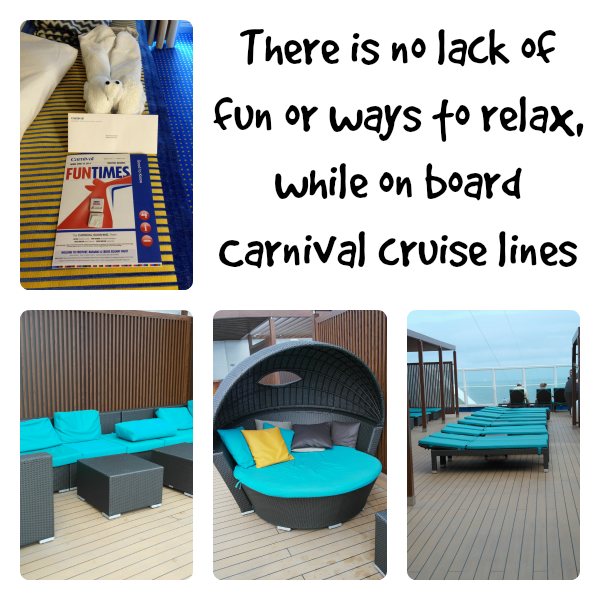 I love those chairs / cabanas on that ship! We had them on ours too and they were so cozy. oh my goodness, how relaxing! i really want to go on a cruise! OMGosh I’ve never been on a cruise, we’ve been talking about it lately though and this looks amazing! I can’t believe there is slides in the pool! I’ve never been but all the recent posts on cruises is making me want to try it out. How cool is it that they have a water slide race track?! Gym or spa? You know where you’d find me! Spa spa spa! This looks amazing, I’ve never been on a cruise! Hubby and I are talking about going on one next year! Ok, I so want to go on a cruise! This is nice. Wow! This cruise looks amazing. There was a time when I was interested in cruises ( I have no idea why), but that time has come and gone. I so need a relaxing cruise!! We’ve gone for an anniversary and loved it! What a great time, I love those slides! I have never been on a cruise, but how lovely does that look? Definitely on my ever growing to-do list. That looks like pure paradise! I’ve never been on a cruise before. Ive been on a cruise out of MOBILE and NOLA for Carnival, both were pretty fun. Overall I really do enjoy cruising than most vacations. My hubby and I were just talking about taking another cruise…I will be checking out Carnival. I’ve never been on a cruise. I know, I know, I need to! We’ve talked about it. Living in Ohio kind of stinks, we’d have to fly somewhere. i’ve never been on a cruise. not once. i would love to go…with or without the kids. i feel like a cruise has options for ANYONE and EVERYONE. Never been on a cruise and this one looks like the perfect one to start the experience on. Love those pools! OMG that slide is ON the ship. Awesome. I love how everything is made so easy for you on a cruise. I’d love to go on one at some point. The pictures here look great, I love the slides. I haven’t cruised with Carnival yet, but I’ll definitely be keeping them in mind for my fall trip. I have never been on a cruise, but I am always lusting after the photos of Carnival Cruise Lines. Someday I will get my hubby to take me! 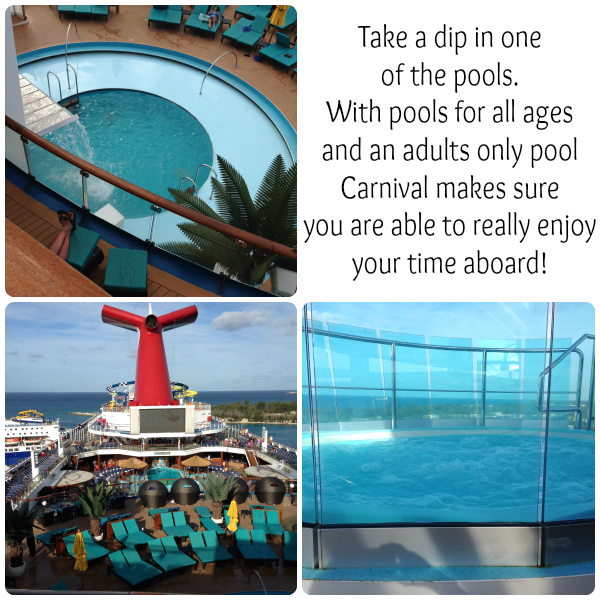 My favorite part of my carnival cruise was the adults only section and the water slides! Wow, you had an amazing time! Everything looks like so much fun. I haven’t been on a cruise yet but it going to happen in the near future. We just need to nail down a date. Looks like you had a GREAT time!! My goal is to go on a cruise before the year is out. That slide looks like a blast! We usually take at least one cruise every year; they really are great for families. We were recently on a boat ride and saw one of these cruise ships. My son was fascinated by the water slide! I have never been on a cruise! I think maybe I should start saving up! You know I have never taken a cruise before. I have always wanted to, this looks like a dream vacation. Spa and fitness center would be awesome. Going on a cruise is on my bucket list! This makes me want to move it up much higher on my list! It just looks amazing! I so totally want to go on a cruise, this looks amazing! I’ve never been on a cruise before. I want to take one so very badly – they look like so much fun! Wow, that is awesome! I’ve never been on a cruise. It looks so wonderful. This looks AMAZING!!! I’d love to go on a cruise. Your pictures look great and I’m sure you had an amazing time! Looks like you had a great trip. I really need a vacation and great food. My husband wants to go just to ride the slides! Looks like you had a blast. This looks amazing! I’ve been on a cruise before, but my husband hasn’t. I’d love a getaway.